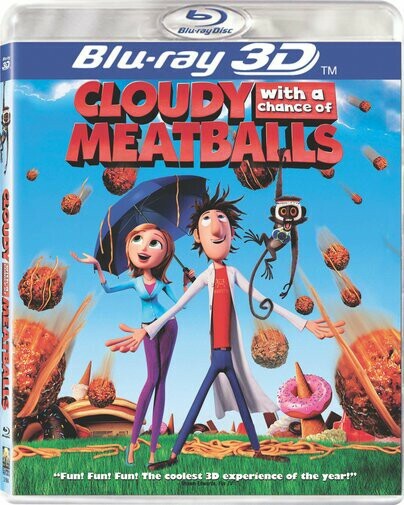 Continuing with our journey, we head over to the animation side of things and thanks to the folks at Sony Home Entertainment we get a BD 3D look at "Cloudy With a Chance of Meatballs"
"Cloudy With a Chance of Meatballs" is a diamond in the rough kinda tale that's all about an inventor named Flint (Bill Hader). Ever since he was a kid, Flint has always wanted to be a great inventor. Sadly his inventions never worked. But through the support of his mom, but some reluctance from dad, Flint never gave up his dream. Since the small island town where Flint lives, Swallow Falls, is all about sardines, Flint creates a device that turns water into a variety of foods. It initially fails, but Flint gives it another go, which happens at around the time the Mayor (voiced by Bruce Campbell) is unveiling a theme park for the town, with some media attention lead by Meteorologist/intern Sam (Anna Faris). Once Flint gives the device some juice, it rockets into the sky, causing it to rain food. Soon Flint is the hero of the town, but the device goes haywire creating giant food! 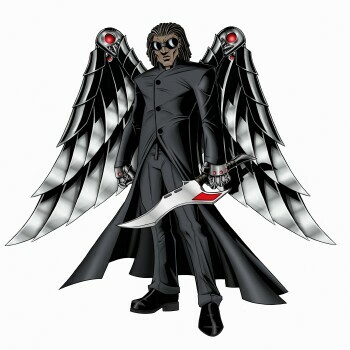 Now Flint with the help of Sam and others must head for the skies to stop the device before the insane food weather anomaly destroys the entire world. The BD contains loads of extras; for one, you get the option of watching the film in 3D (if you have a 3D television and glasses) or in standard 2D. Next is "Recipe for Success: The Making of Cloudy with a Chance of Meatballs", which is a behind the scenes look at the making of the film. You'll also get extended scenes, 3D movie trailers of upcoming titles, a music video from Miranda Cosgrove "It's Raining Sunshine" and even a behind the scenes look at the making of the music video. Considering all this, just what do I think of the film exactly? I loved it! First off the animation is excellent, not Pixar quality especially in the humans, but it's there and it works; I mean it's a movie about giant food raining on a community, I shouldn't expect great animation accept where it counts and that's the presentation of the food, which looks delicious! I never wanted a steak so badly after watching this flick. The plot is simple, very effective, straightforward and easy to follow. I thought the pacing was tight and spot on perfect, which you're locked onto this film until the very end. But what pushes the film over the top is the superb voice cast. Bill Hader (SNL regular and animated voice actor) does a superb job as Flint, but Anna Faris is a definite win in my book. I didn't expect to hear Bruce Campbell's voice as the Mayor and when I did, my geek senses went on overload (that's a positive thing). Finally break out voice goes to Mr. T, who should definitely do more voice-work after this. So solid film, great cast, a wealth of extras, and awesome animation makes for one must see hit. Kudos to Phil Lord, Chris Miller and co for a wonderful film. Some minor nitpicky stuff such as Flint losing the USB kill code; I know it gives the dad (voiced by Jame Caan) something to do, but I more annoyed if anything. What does a town that has dammed leftover food smell like? Ugh! Cloudy With a Chance Of Meatballs is a definite winner in my book that has a little something for everyone and teaches us that you're somebody no matter what you do or who you are. I highly recommend picking this one up. And out of TOV 5 stars, I give Cloudy With a Chance of Meatballs 4.5 stars and it's been Valkor tested, TOV Approved.